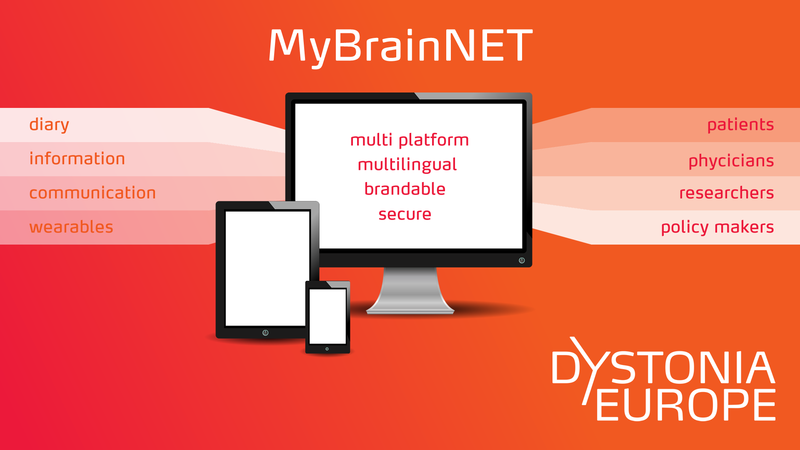 MyBrainNet is a new exciting project of Dystonia Europe which we want to create in order to improve patient physician communication; to connect patients with other patients; to provide accurate and unbiased information about their disease. MyBrainNet provides a digital diary for patients to keep track of their daily activities in relation to the disease. This has already proven to be an invaluable tool during appointments with the neurologist and other medical professionals. At the same time an user can choose to share his/ her data collected through the diary with the scientific community for research purposes. If an user chooses to do so, the data will anonymously be stored in a searchable database which can be used for scientific research, now and far into the future. Our aim is to retain all anonymised data for an indefinite period of time. With the growth of the amount of data this database, the usefulness of and possibilities with the information increases over time. Besides the option to fill in the diary by hand we envision the possibility to connect several types of wearable devices. These devices can automatically gather valuable information, which combined with the diary information, will provide a unique set of data invaluable to most research projects. MyBrainNet will be set up in such a way that the platform is customizable to fit most kinds of brain diseases, while the platform itself is brandable to be published by any European patient organisation for brain diseases. This is an very important element of MyBrainNet. We seek active collaboration with other European patient organisations. We see collaboration as an opportunity to create a high quality platform from which we, and our members, can all benefit. By sharing and collaboration we aim to reduce the costs greatly compared to the development of individual platforms. We also collaborate in providing important research data from a very large patient group, combining information across multiple disease types all across Europe.